The Zero Waste Station aims to help stop waste created from single-use items! 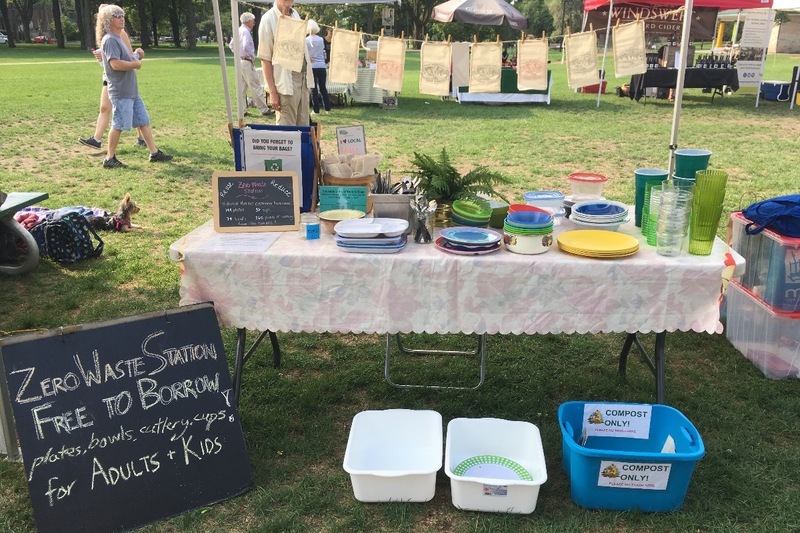 Beginning in July 2018 Withrow Park Farmers’ Market introduced a reusable service ware program at our market. We lend out reusable dishes, cups, bowls & cutlery to anyone staying at the market to eat. From July to October we stopped 2500 single-use items from going to the landfill. Most of these items are only with the customer for 2 minutes before they get thrown into the garbage. Which is completely bonkers if you think about it!! Incredibly this project has gained interest from others, interviews with Toronto-Danforth's MP Julie Dabrusin, for CBC Radio-Canada https://bit.ly/2pj1QPG (link to article), and by a reporter from the Toronto Observer https://bit.ly/2QZiW0Q (link to article). *We purchase from thrift stores (75% of total inventory) and in-kind donations (25%) as a way to give a longer life to items already in the system. Reusables are the best overall path to reducing our landfill use. Much of take-out packaging offered today is coated in plastic making it garbage according to the City of Toronto's waste collection guidelines. Biodegradable plastic is garbage. Bamboo cutlery is garbage. Compostable cutlery is garbage. Plastic, but not black, that is cleaned first can go into the blue bin. Black plastic is garbage. Please support this program and its continued growth. Any amount will help, whether it's $20 or $200! We know its success will inspire other markets to start their own green initiatives. Reuse is the only real way to stop garbage from hitting our landfills!! We've got to show this planet some more LOVE! I’m a long time Toronto resident, and at the beginning of 2018 I set out to change my habits, to live a more waste free lifestyle. I'm constantly learning from the wise people I meet who've been at this for much longer. I'm an active member of Zero Waste Toronto's online FB group, a volunteer for Live Green Toronto, and a Board director that oversees Withrow's farmers' market. Managing and operating the Zero Waste Station in 2018 meant I got to put into action my project management skills. I enjoy working on projects, both personal and professionally, and introducing a reusables program at the farmers Market is a project I feel extremely passionate about.